Welcome to our gallery of beautiful waterfall kitchen islands featuring a variety of materials and design styles. They say that the kitchen is the heart of the home. It is where the family congregates and spends a large amount of time to bond with each other. And being one of the busiest places in the home, don’t you think that it is just right to treat your kitchen to an added touch of luxury and sophistication? Waterfall kitchen islands are one of the design features you can explore if you want to add a “wow” factor to your homes. Being one of the progressing trends in the modern kitchen design scene, a waterfall island can work wonders in instantly creating a modern and sleek countertop that updates the look of your kitchen. What is a waterfall kitchen island? Also known as a “work surface wrapped island” , ‘waterfall end panels” or “risers”, a waterfall island is a type of kitchen island wherein the countertop edge flows to the side of the island’s body. Usually the horizontal worktop is extended vertically to the side panels of the cabinetry, continuing down to the floor. The flowing worktop is reminiscent of cascading waters from a waterfall. This resulting “waterfall effect” gives the origin of it its name. With waterfall kitchen islands, the countertop, the cabinets and the flooring all look connected with each other. It differs from the conventional kitchen island which usually has the worktop ending at the edges. Technically speaking, it also refers to a type of seamless edging employed to counter top materials. If using a peninsula or an appendage to an existing working counter which is fixed on one end, the waterfall island edge is usually implemented on just one side. This provides an added visual interest to the design of your kitchen. For kitchen center islands, the waterfall edge can be implemented on both sides. This results to a more symmetrical design wherein the worktop is the same material used for the side panels of the island, which in turn creates a more balanced look. Waterfall edges are not only limited to peninsulas or islands, as it can also be used for other kitchen layouts like an L- shaped, U- shaped, galley or one walled kitchen, wherein the design technique is reflected to an open end of the perimeter counter. When it comes to designing your very own waterfall kitchen island, there are a number of design approaches that one can explore. A wide variety of materials choices that come in a broad spectrum of colors presents an unlimited opportunity to mix and match the perfect finish and color palette which suits your personal preference in design and style. It allows you to layer textures, color and finishes within your kitchen. You can choose whether you want to blend to create a harmonious look, or to contrast if you want to allow the waterfall island to stand out in the space. Consequently, this will also allow you to cut material costs as you can carefully choose which materials fit in your budget. Typically, the countertop used for the main kitchen layout is the same material that is incorporated into a waterfall kitchen island. Alternatively, you can also match your waterfall kitchen island countertop with the color of your bar stools. Adds an aesthetic appeal. There is no doubt that the primary reason as to why waterfall kitchen islands are very popular is because of the beauty that they add to kitchens. Though this design technique is simple, it creates a visually interesting and eye catching finish that creates a statement that will last for years. Works as a strong accent piece or focal point for a kitchen . The kitchen island is one of the largest features in the kitchen. So naturally, it is one of the things that gets easily noticed when someone enters the room. Waterfall islands serve a strong accent pieces for kitchens, putting emphasis to the center of the space, consequently drawing the eyes constantly back to it. Anchors the overall design of the kitchen. A waterfall kitchen island can also be used to anchor the design of the room, providing a strong visual element wherein all the other decors merge. It can be a good starting point for creating the right kitchen design for your home. It sets the tone for your entire kitchen, allowing you to contrast, blend or enhance the prevailing style and color scheme. 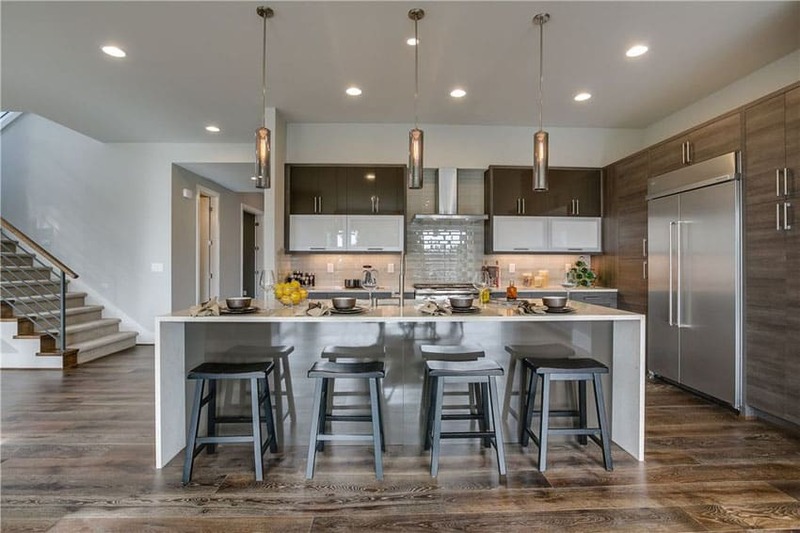 Once you have decided on the look of your waterfall kitchen island, you can now determine if you want matching appliances, contrasting cabinets, light or dark flooring, brushed satin cabinet handles or antique finished drawer pulls, and so on and so forth. Offers the perfect opportunity to introduce a contrasting element to the design. Contrast is one of the key elements to a well balanced design. The waterfall kitchen island offers a way to create a powerful complement that puts emphasis on contrast in the kitchen. A striking contrast of color and material finish will allow you to grab the attention of anyone entering your kitchen. You can either choose a light waterfall kitchen island countertop that has a stark contrast with dark wooden cabinetry. Or explore a more classic color combination such as a “black and white” kitchen motif by choosing a cascading black granite countertop to go with with high gloss ultra white cabinets. Modernizes any style . Modern design usually conforms to defined lines, streamlined shapes, angular forms and strong angles. A waterfall kitchen is perfect for a contemporary kitchen because the ends of the islands creates a well defined 90 degree angle that displays a smooth transition of finishes. Also the whole uniform surface forms a continuous look that is sleek and clean. Waterfall kitchen islands also exhibit symmetry and create a more balanced design. Although more prevalent in modern kitchen styles, a waterfall kitchen island can also be used in a more traditional inspired setting, provided that it is done with careful planning. It is a good way to update the look of classic shaker cabinets or paneled cabinetry. Introducing a waterfall kitchen island gives a touch of modern vibe. Mixing the contemporary aesthetics of a waterfall kitchen island with traditional elements will produce a fluid, timeless appeal. No matter what design styles are mixed, the end result will always be an elegant, clean and sleek look. Allows you to show off your unique natural stone. Remember that feeling when you want a stone so much that you almost wish you can put it up on a whole wall in your kitchen. Well, the waterfall kitchen island is the closest thing you can get. 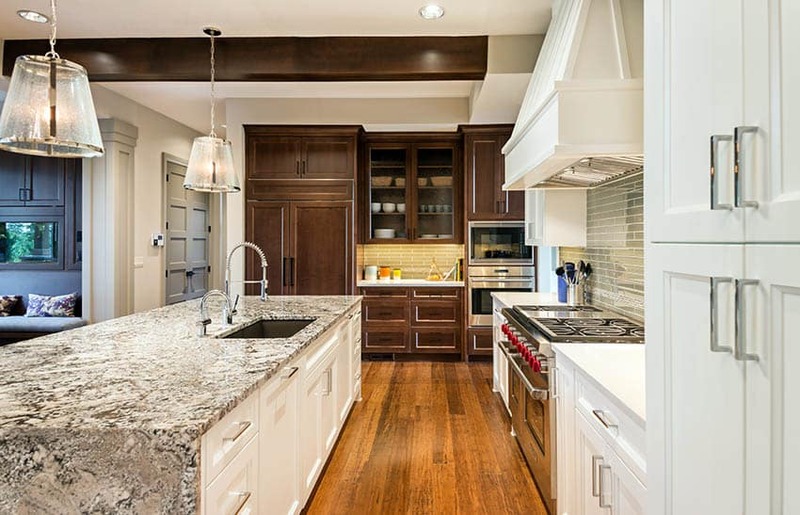 Choosing a countertop material for your kitchen can be quite a daunting task. As you are presented with endless choices, finding the right stone can be quite confusing. If you have taken a lot of time and effort to search for the perfect countertop material, of course you would want to feature it as much as possible. And since kitchen islands are one of the most dominant features in a kitchen, it provides the perfect opportunity to display that unique, rare stone that you are proud of, as a stunning piece of art. 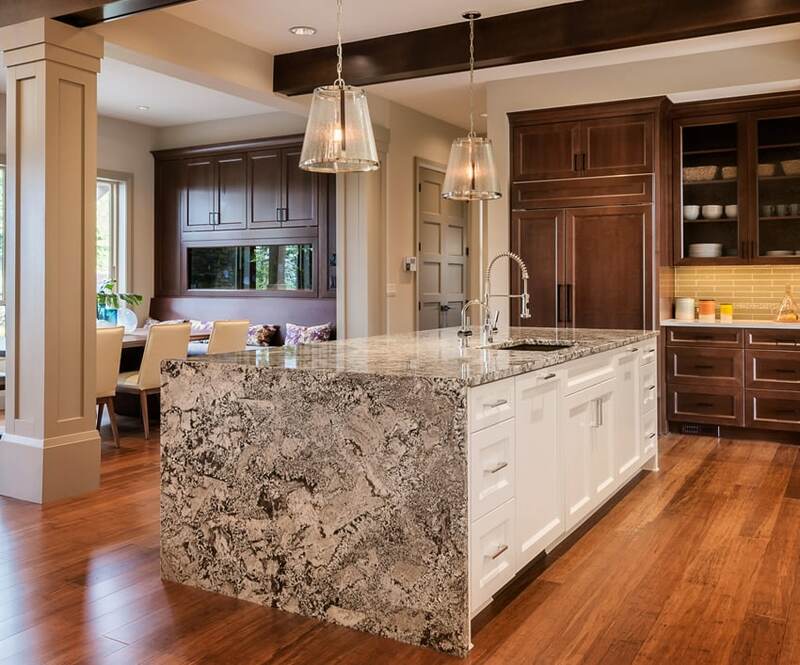 Typically, a kitchen countertop can only viewed when you are standing but with a waterfall island countertop, the countertop material is extended to the sides, allowing anyone to get a full view of your granite or marble even when they are seating or far away from the kitchen. A waterfall kitchen island creates emphasis – so it can be used to highlight a dramatic veining pattern in a marble or to showcase rich striations in a patterned granite. It also works especially well in open plans, wherein the waterfall island can be seen well from the other areas in the house. Practical Benefits. Aside from the stunning aesthetics that waterfall kitchen islands contribute to kitchens, they also provide several practical benefits and functions. Just like any regular kitchen island, a waterfall island offers multipurpose uses. It can be used as an extra space for casual dining with family or for entertaining friends, can be utilized as an additional work counter, can be incorporated with extra built in storage, some appliances or a sink and it can serve as a zone for specialized tasks like butchering, baking or bartending. Among these, the most common use of a waterfall kitchen island is a breakfast bar or a casual dining area. In a modern setting, the kitchen, particularly the island, is recognized as a “social hub” in the home. Aside from using the waterfall kitchen island for eating, a bar can be used as an additional seating area for guests. Some people also use this to bond with family, whether by sharing tasks in the kitchen or for recreational activities with kids. You can also utilize it for working, studying and other personal activities. The projected worktop can also be extended to the back of the kitchen center island to create an overhang for concealing appliances or for sliding stools underneath. Keeping the clutter or other furniture tucked away allows the natural finishes to stand out, thus creating a cleaner and more expansive look for your kitchen. Overhangs and terminating edges for countertops are also more prone to scratches as people usually bump into them. But with a waterfall edging for your kitchen island, the side panels are more likely to stay scuff free. Especially if your waterfall kitchen island is made up of a durable countertop material like granite or quartz which are naturally scratch resistant. Also, this is much easier to clean compared to a wooden side panel for your kitchen islands. A waterfall kitchen island also assists well in protecting your cabinets. In addition to that, a waterfall island counter is more child friendly compared to overhangs and other types of edges. There is no need to worry about kids hitting sharp edges in the counters and also, there are no risks of bumping your waist to the counter. The gorgeous black Calcatta marble counter top of this contemporary kitchen’s waterfall island counter is a true feast for the eyes. With dramatic black and gray veining and strong undertones, it serves as a strong focal point for the simplicity of this space. 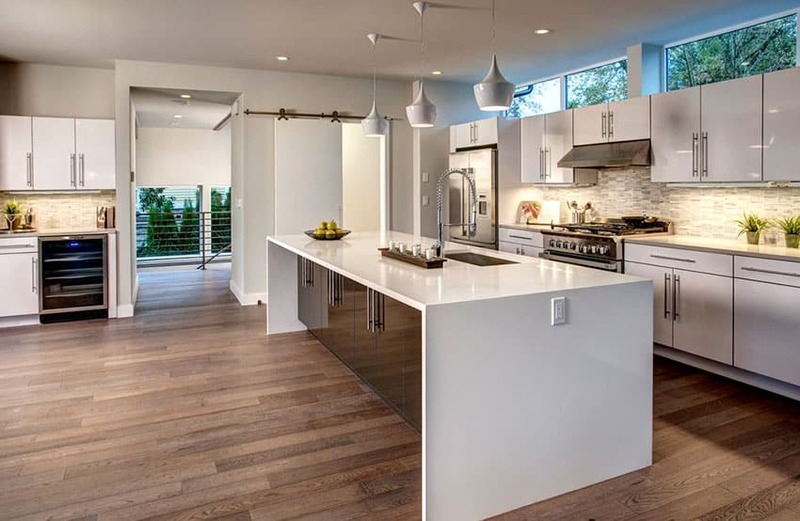 Light maple wooden flooring add warmth which contrasts with the bright, cool feel of dominant white finishes for the walls and the shaker cabinets. The addition of dark wooden bar stools render a natural coziness to the space, making the bar dining area appear more welcoming and inviting. Waterfall countertops cost more than regular counters because they use up an additional material and require extra fabrication charges. Natural stone such as marble, granite and quartz can range from $75 to $120 depending on the material. With waterfall kitchen counters, you need to consider the additional area which has to be covered with your desired material. So instead of buying material just for the top of the counters, you also need to purchase more for the side panels. Typical labor costs for countertop installation can range $60 to $100 per square foot. However, for waterfall kitchen island counters, the labor costs more. In order for stone surfaces to get a continuous look, the edges of the material need to be precisely cut using a control laser cutter. This process alone can add $1000 to $2000 to the project cost. 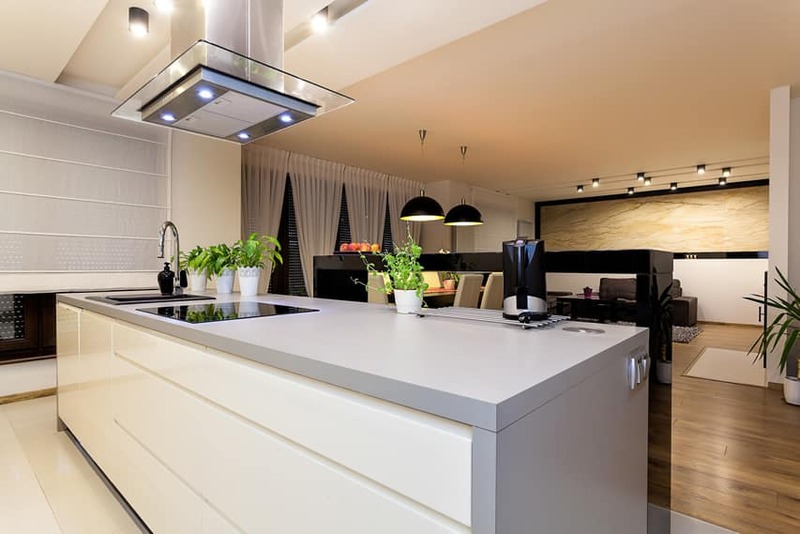 Generally, waterfall kitchen island countertops cost more but prove to be wise investments as these can also increasingly affect the resale value of your home. Choose a high quality material and a reputable supplier. The material that you need to create a waterfall island counter needs to be a whole slab with seams only used at the edges. The cuts which are implemented in a waterfall edge counter is more complicated compared to a regular bull nosed edging. Make sure that this is done by a skilled professional to ensure that your material is handled with care and installed with the only the best quality of work. To prevent your kitchen counters from competing with the waterfall kitchen island counter, choose a type of edging that is simple and not too ornamental, like a bevelled edge, eased edge or a bull nosed edge. If you want to put emphasis on the lines and thickness of your waterfall edge counter, you can upgrade to a “stacked edge”. A stacked edge or a laminated eased edge is a 6 centimeter or 2.5 inch edge that makes use of a faux second layer of stone. This makes your countertop material, such as a granite or marble, appear thicker. This is also a great way to reduce on costs without compromising the looks of your waterfall kitchen island. To create almost invisible seams for your waterfall kitchen island counter, make sure that the edges are cut in a 45 degree angle. The mitered edges ensure the countertops and side panels fit well together and more seamlessly. Also make sure that the edges are polished. Alternatively, you can also have the top or the horizontal counter stacked above the side panels or the vertical counter. Almost any material that is used as a countertop can be transformed into a waterfall edge counter. Your choice of material will greatly depend on the look and style you want to achieve for your kitchen. 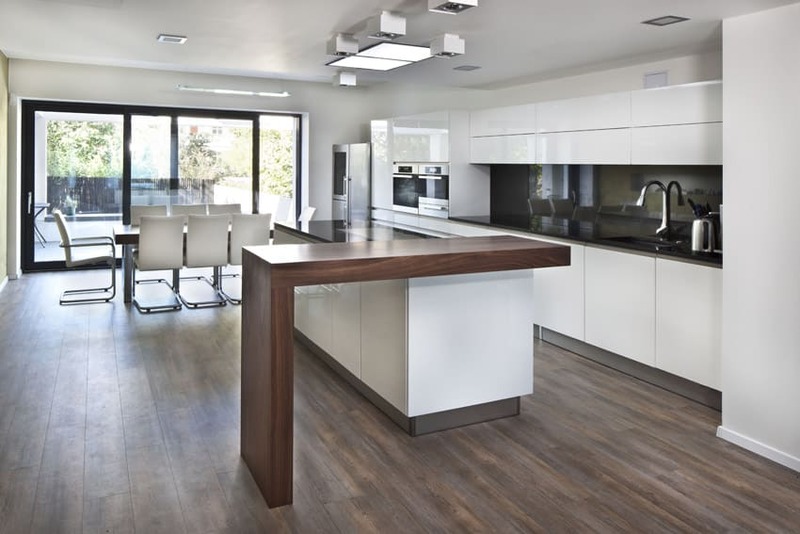 Below we explore some of the most common types of materials used for waterfall edge counters, along with an overview of their positive and negative features. Granite – Granite is the most popular countertop material. It is a natural stone that is quarried from the earth and is made up of quartz, feldspar and mica. Granite is usually excavated in large blocks then divided into slabs and polished to show their unique, distinct beauty. The unique composition of granite gives it its hardness and inherent visual appeal that has speckles, striations, veins and flecks. Each slab has a unique appearance and it comes in a wide range of colors, making the possibilities for design endless. Well loved not only for its distinctive appealing aesthetics, granite is also known for being one of the most durable natural stone finishes. It is heat and scratch resistant and can withstand the wear and tear of constant day to day use. However, granite is sensitive to acids and may cause certain discolorations once exposed to it. With the presence of such drawback, periodic sealing is needed to ensure that no stains and liquids seep into the stone’s surface. Since granite comes in slabs, its large size allows it to be manipulated freely into different forms and sizes, making it a highly suitable material for waterfall edge kitchen counters. With large slabs, there are less seams. Also, the distinct beauty of granite makes it worthy to be showcased in a bigger scale. You can either choose from dramatic veining, exotic striations or unique mottled patterns.Some granite types also have metallic minerals which sparkle when exposed to lights. When used in a waterfall kitchen island, it renders a luminous and brightening effect to your kitchen’s interior. Waterfall edges help granite countertops to resist chipping. As most corners have the tendency to the crack, eliminating these open edges will ensure that your countertop doesn’t get damaged when bumped into. Some examples of granite which look stunning in waterfall kitchen islands are antico cream granite, uba tuba granite, alpine white granite, black marinace granite, Bordeaux cream granite and black galaxy granite. Cost: The cost of granite countertops is $20 to $75 per square foot, depending on the type, pattern and color of the material. Marble – Marble is a natural stone which is formed from limestone that is heated and subjected to the pressure of metamorphism. Primarily composed of the mineral calcite, marble is also made up of other minerals such as clay, mica, pyrite, quartz and graphite. When subject to metamorphism, the calcite in the limestone forms into a mass of interlocking crystalline structure. Marble is used as a countertop material because of its durability which enables them to last for years. It also has a naturally cool temperature, which keeps workspaces thermally controlled. Aside from these, marble is also known for its classic beauty and natural elegance. Just like granite, it also has an inherent beauty that is worthy to be shown off. 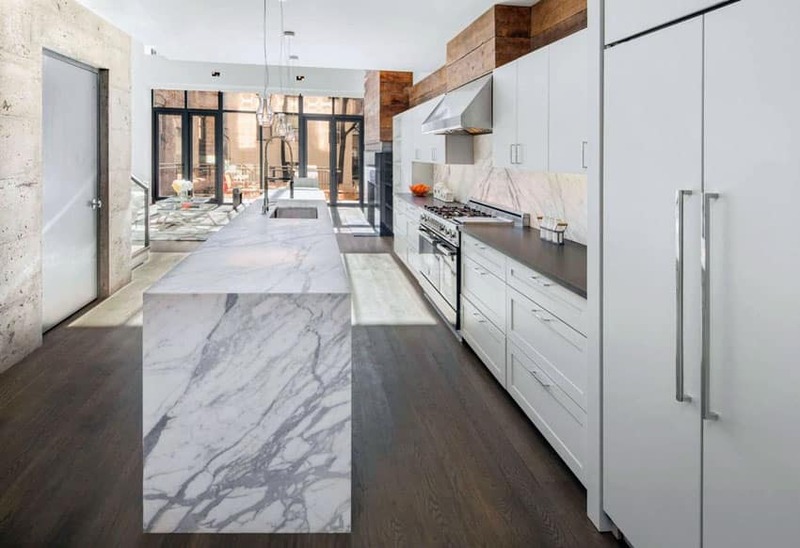 If you want to create a bold statement for your kitchen, a luxurious marble waterfall kitchen island is one of the best design features you can explore. Marble usually have distinct veining patterns which flow gracefully over the stone’s surface. This make them a natural choice for the waterfall design because the veining pattern can run over the top, continue to the edges and continue all the way down to the floors. It creates a dramatic effect and a strong contrast to plain surfaces, highlighting the unique design and pattern of your stone. Some examples of marble which look extra dramatic as countertops for waterfall kitchen islands are : white carrara marble,calacatta marble and the statuario marble. Cost: The cost of marble countertops are $25 to $75 per square foot. Quartz – Quartz come in two types: one is a type of natural stone that is quarried from the earth, in the form of slabs while the other is a man made material or a type of engineered stone. 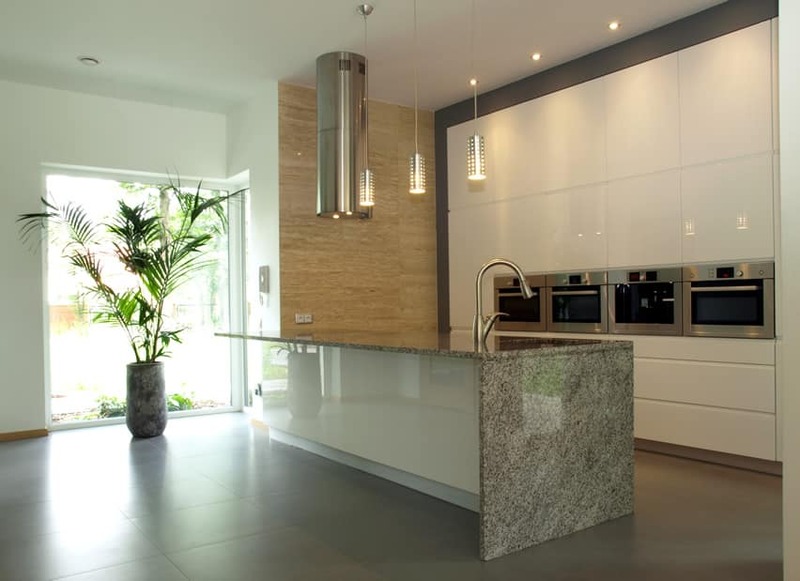 Quartz engineered stone is mainly composed of more than 90% of natural materials – 93% of crushed quartz powder and 7 % of epoxy resins, to be exact. The addition of an epoxy based resin holds the crushed particles together, while reinforcing the strength. Man made pigments are then added to this mixture to give color to engineered stone. Quartz comes in different designs and colors which have the same veining pattern and speckling to marble and granite. Quartz resembles the appearance of natural stone but it needs less maintenance. Just like granite, this material is also extremely durable and is resistant to heat, scratches and stains It can withstand knife marks and even abrasive pads and is proven to last for years. Unlike natural stone, quartz doe not need to be sealed for protection. However, quartz is sensitive to UV rays, resulting to changes in color once regularly exposed to the heat of the sun. Compared to natural stone materials, the color of engineered stone is uniform all throughout, making it the perfect material to use for a seamless waterfall kitchen island. Unlike, granite which usually needs to be bought coming from the same batch to ensure book matching, an engineered stone countertop is more likely to produce a transition that has an even color. So if you are very particular when it comes to natural imperfections and blemishes which can be found in natural stone countertops, then Quartz is the ideal material for your waterfall kitchen island. Quartz is also more flexible and easier to handle, compared to other materials, which makes it highly customizable into a waterfall edge counter. Some examples of quartz which look exquisite as countertops for waterfall kitchen islands are calcatta classic quartz, perla white quartz and taj mahal quartzite. Cost : The cost of quartz varies depending on the brand of the material. Generally, it is more expensive than granite, costing an average of $70 to $95 per square foot. A basic quartz counter typically cost $60 per square foot, while high grade quartz cost up to $100 per square foot. Solid Surface – Also known as Corian, solid surface is a type of an artificial material that is built to look like natural stone, but has the positive attributes of a modern alternative. Unlike stone, solid surfaces are non porous. The original intent in manufacturing and inventing this product is to create a surface that is homogenous and same all throughout- from the top, middle and bottom. Solid surfaces have extremely low porosity, thus they are not prone to bacteria, molds and mildew. It is also very durable because the material is solid all throughout. Although not scratch resistant, solid surface countertops can be easily repaired through resanding. Solid surfaces can be fabricated into waterfall kitchen islands, however they need to be done by a professional installer using special tools. Solid surface are suitable for waterfall kitchen islands because they create a practical extended surface that be used as a work space and as a durable protection for cabinetry. It can be finished with a seamless edge that has almost invisible joint lines, creating a clean look. And since it also looks like a natural stone, a solid surface waterfall kitchen island will have the same aesthetic appeal. This type of material is ideal for modern and contemporary kitchens. Some of the most popular brands of solid surfaces which can be used for your waterfall kitchen island are Formica, Staron, Gibraltar, Avonite and Mystera. Cost: The cost of solid surfaces counters re $52 to $120 per square foot, depending on the brand or manufacturer of the material, the style, color and pattern. Laminated Countertops – Popularly known as Formica, laminates are made up of several layers of different materials that are sandwiched together. The top layer is made up of a melamine resin that protects all the other layers. A decorative layer contains the design and color. An overlay or wear layer is made up paper that is similar to coffee filters, that is combined with aluminum oxide and melamine resin. The core of the laminate surface is made up of Kraft paper that is hardened with resins. Laminates are easy to install and can withstand stains and heat, however, some laminated kitchen countertops are sensitive to excessive exposure to water. Laminates also come in a variety of designs and colors, ranging from plain, solid ones to patterned variants which mimic the appearance of wood and stone. It comes in 4 feet by 8 feet sheets which can be used to cover large surfaces such as cabinets or an island counter. Laminates can also be easily cut and modified into shapes. The most common design, which is a wooden pattern, looks striking on waterfall kitchen islands, creating warmth and adding contrast to spaces. Laminated waterfall kitchen islands are also ideal for contemporary and modern inspired kitchen settings. Cost : Laminates are generally inexpensive, with its cost ranging $5 to $25 per square foot depending on the design. Concrete – Concrete is made up of a mixture of cement, gravel, sand aggregates and water. It is porous but once sealed, it becomes stain and water resistant. It is also does not get damaged from hot pots and pans. Concrete is an ideal material for waterfall kitchen islands because it can be produced in long spans without the need for joints and seams.It is flexible and highly customizable in terms of shape, size, color and finish. This is ideal for modern and contemporary kitchens, particularly industrial inspired settings. Cost: The cost of a standard 1.5 inch concrete countertops is $65 to $135 per square foot. Solid Wood – No other material can match the distinct natural beauty and warmth of a solid wood kitchen island countertop. Aside from the added aesthetics, solid wood is also extremely durable and resilient. However, it needs to be treated and sealed before use to protect it from molds, mildews and insects. Specifically used as a butcher’s block, solid wood waterfall kitchen islands can be used for direct chopping. This material works perfectly well for waterfall kitchen island because it contributes a sense of natural coziness which makes kitchen feel more relaxing and inviting. Also, retaining wood’s raw look and leaving it unfinished complement country, rustic and farm house inspired kitchens. The most common wood species used for waterfall kitchen islands are cherry, maple, wenge, walnut, bamboo and teak. Reclaimed wood or raw wooden planks can also be used as cheaper alternatives. Cost : The cost of solid wood kitchen counters is around $ 30 to $60 per square foot, with an average of $40 per square foot, depending on the type of wood. Maple typically cost $45 to $75 per square foot, while walnut costs $100 per square foot. Teak is the most expensive species, reaching about $130 per square foot. Butcher’s block is usually $40 to $65 per square foot. Below we explore some examples kitchen islands with stunning waterfall island countertops to help you get inspired in designing your own home. 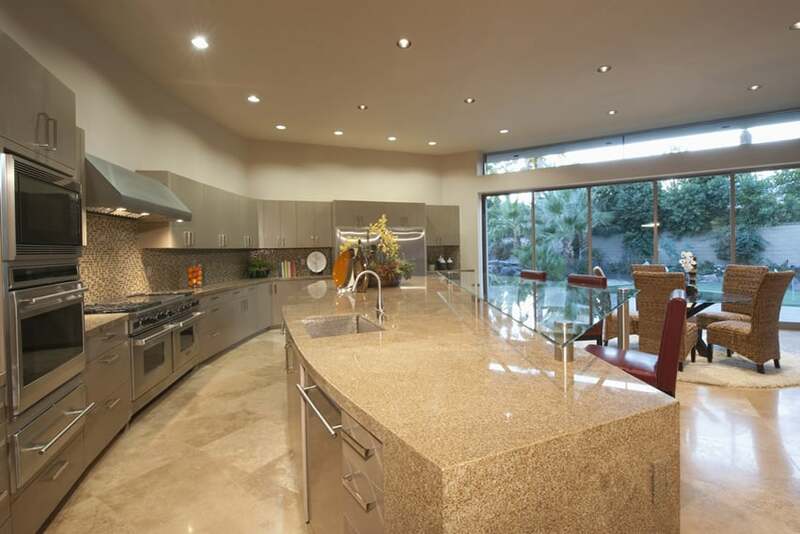 The picture above features an elegant contemporary kitchen with a waterfall island and a dining area. The stunning marbled granite counter top of the island stands out against crisp white walls and ultra white glossy cabinetry, serving as an interesting main attraction for this kitchen. We can also see how the warm undertones in the veining pattern of the granite tastefully matches the earth colored ceramic tile flooring and the wooden under cabinets. Stainless steel appliances and brushed satin handles provide subtle contrasts, while the mosaic tile splash board and modern inspired red dining chairs contribute a splash of color without overpowering the overall look of the space. This luxury modern kitchen boasts of high gloss floor to ceiling cabinetry, which makes the space appear bigger and brighter. At the center is a full waterfall island counter which serves as a seating space for casual entertainment and dining. White marble counter tops with large gray veining contribute an element of drama while the matching splash board makes the design of the space more cohesive. Satin finished stainless steel appliances like the range hood, wine refrigerator and ovens also match the gray undertones of the waterfall island counter top, rendering a mellow accent to this kitchen. 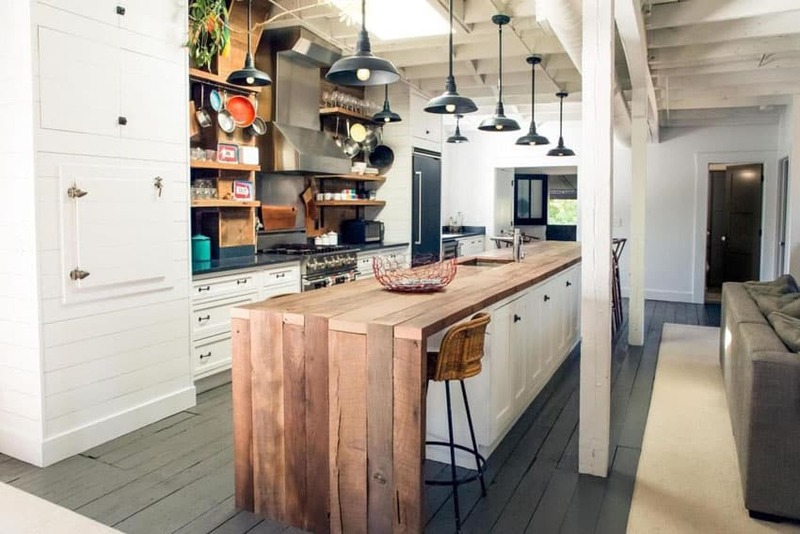 For more ideas featuring large kitchen islands with seating check out our gallery..
To create a more rustic inspired look, use raw wooden planks as a counter top material for your kitchen. Dominating this stunning country inspired farmhouse kitchen is a unique wooden waterfall island counter with an unfinished look. Gorgeous white inset cabinets with antique black handles give a stark contrast to solid black granite counter tops, gray weathered wood flooring and a black painted door. To effectively optimize every inch of the available kitchen space, wooden open shelves are placed above the preparation area, allowing the homeowners to display a wide range of colorful kitchen accessories and glass wares. Hanging from an open ceiling and set just above the kitchen island area series of antique inspired black metal lighting fixtures which ties the accent color for the space. The rich, warm look of this sophisticated modern kitchen is achieved through the use of high grained, medium colored, wooden floors. Floor to ceiling laminated wooden cabinets cover the expanse of one of the walls, providing maximum storage space around the large 2 door refrigerator. Frosted glass pull up cabinets and high gloss chocolate brown overhead cabinets are placed above the prep area, creating the right amount of contrast to white subway tile splash boards. Set at the center is a streamlined waterfall island counter which serves as a casual dining space for four people. To lessen the “heaviness” of the space, a plain white granite counter top is used, creating a perfect balance of hard and soft finishes. The addition of a center kitchen island is the perfect solution to obtain optimum use of space in a one walled kitchen layout as it can serve multipurpose functions in terms of extra storage, working space and prep area. 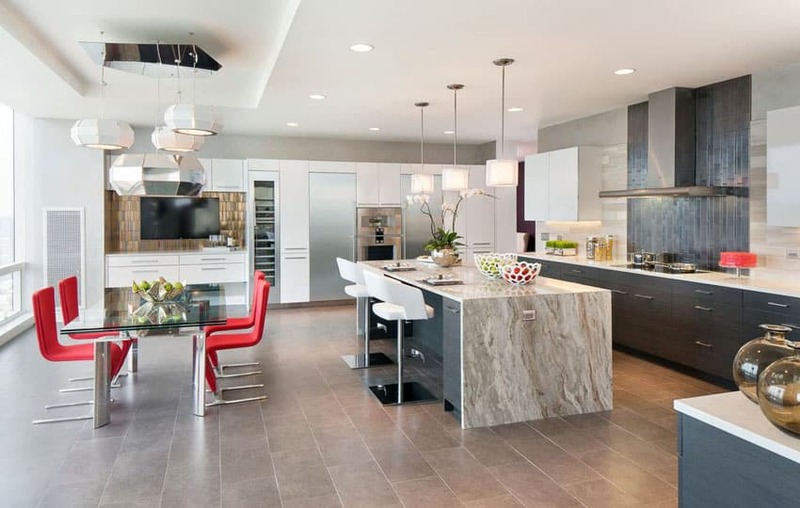 Featured in this elegant modern kitchen is a waterfall island with a white marble counter top that is accentuated with large dramatic gray veins. Combined with classic white shaker cabinets with chrome metal handles and sleek stainless steel appliances, the design of this kitchen exudes elegance and sophistication. 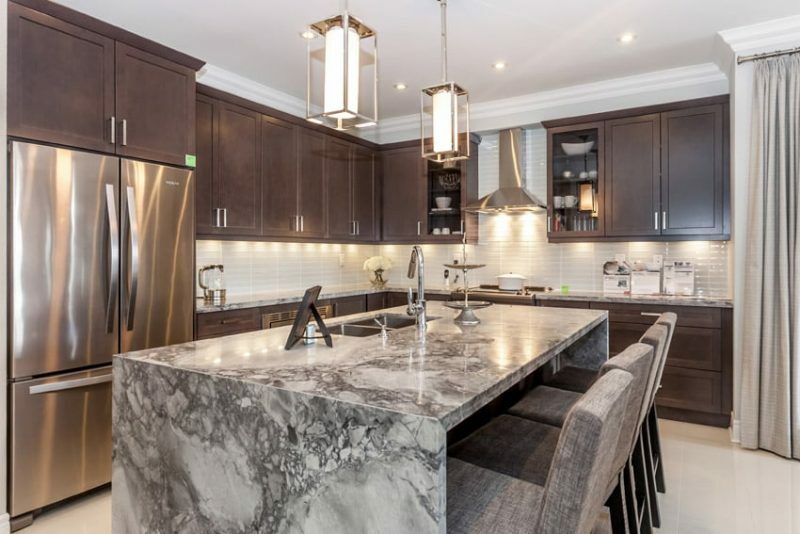 Warm medium stained walnut floors allow the cabinetry and the island to stand out, while the use of black granite counter tops and natural wood fascia boards for the one wall kitchen counter contributes warm accents which give depth to the space. This modern kitchen gleams as ultra white high gloss overhead cabinets span through the walls, making the space appear brighter and look clean. Matching sleek white bar stools with chrome metal legs give an ultra stylish appeal, while satin finished appliances complement the polished surfaces used in this kitchen. The monotony of the light colored cabinets is broken off by using a highly textured tile splash board, creating a subtle accent that doesn’t deviate from the prevailing neutral color scheme. The waterfall kitchen island implements stark contrast between icy white granite counter tops and distressed wooden front panels. An overhang is also used so that the bar stools can easily tuck underneath the island. Balance out the heavy look of dark floor to ceiling kitchen cabinets with the use of a light colored waterfall island. 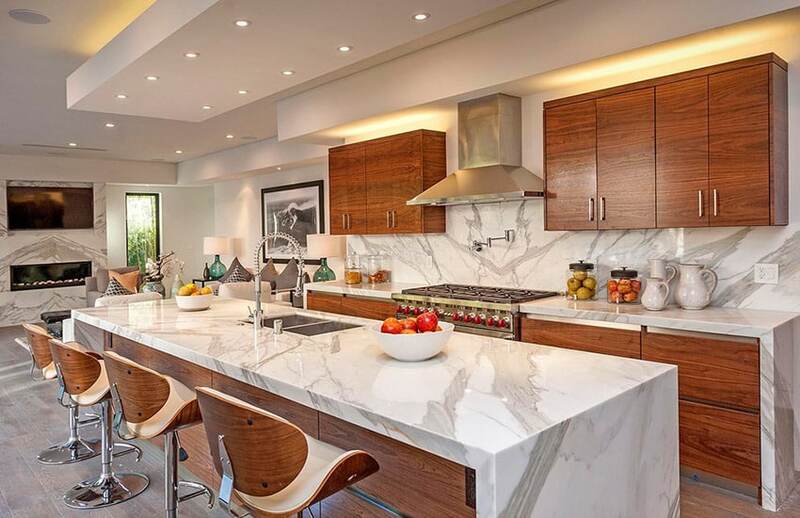 This contemporary kitchen makes use of concrete as the counter top for the center waterfall island, producing a smooth, sleek surface which matches the reflective finish of elegant marble splash boards. Dark laminated modular run through the two walls of the kitchen, providing adequate storage space for kitchen accessories. An added dimension in design is achieved through the use of contrasting light colored wooden flooring which boasts of natural knots and grains. 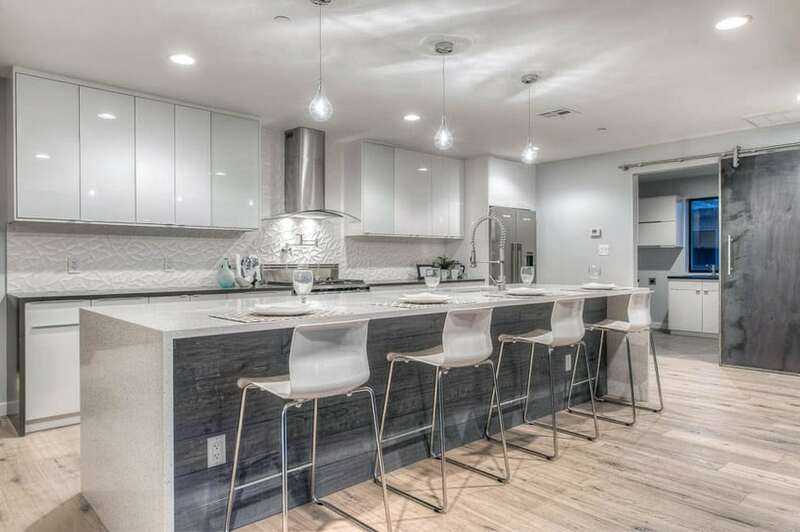 Contemporary leather upholstered bar stools in taupe color are added to utilize the waterfall island counter as a dining area, while lending a complementary color to the monochromatic palette of the space. Create a striking point of visual interest into your kitchen space by extending ultra luxurious marble counter tops to the sidings of your kitchen island. This allows you to display in a larger scale the beauty of rare and exotic stones, just like the one shown in this picture. If you look closely, the joints between the top and side panels are mitered, ensuring an almost invisible seam, while the termination for the front edges are beveled. The gray undertones of the marble are complemented with polished chrome cabinet handles and stainless steel appliances. The combination of dark inset wooden cabinets and white ceramic subway tiles create contrast with beige colored polished ceramic tile flooring. Comfortable taupe upholstered bar stools are also added, instantly converting the waterfall island counter to an “in kitchen” dining space. Truly, no other material can match the beauty of wood and natural stone finishes. This contemporary kitchen combines both classic and modern features into one elegant look using luxurious natural materials. The accent walls, along with the counter tops and the waterfall island all make use of rich white marble with dramatic gray veins. Matching these finishes produces a harmonious and cohesive look while showcasing the unique beauty of the stone. Red cherry overhead and under counter cabinets with streamlined designs and plain brushed metal handles introduce a warm inviting feel. The front panels of the waterfall island also make use of the same red cherry wood, creating the same harmonious effect. 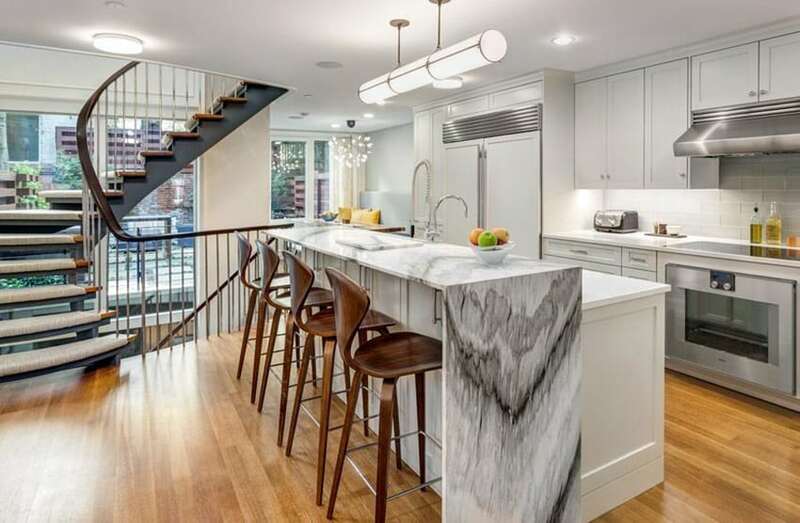 This kitchen island breakfast bar is furnished with classic modern wood and metal bar stools. Proving that less is always more when it comes to modern design, this waterfall kitchen island exhibits elegance and beauty despite its notable simplicity. Made up of gray engineered stone counter tops and laminated white cabinets, this waterfall island is the perfect element to anchor a modern inspired kitchen. Stainless steel appliances complement the sleek, smooth surfaces while black accessories introduce an accent color that is strong yet not overwhelming. In this icture, we can aso see how the waterfall kitchen island stands out in the surrounding warm toned dining and living areas. This stylish waterfall island features a striking gray granite with white and charcoal colored flecks. By using a large overhang and a white colored base cabinet which matches the back walls, the waterfall island gives an illusion of a cantilevered counter space, which is large enough to cater to different food preparation work in the kitchen. High gloss white cabinets are set up in one full wall, giving maximum storage space. On the left, you can see an accent wall made of sand colored natural stone, which gives life to the space. Minimal decor was used, with only modern drop lights and stainless steel appliances serving as accessories. The use of gray ceramic tile flooring makes the over all neutral palette more cohesive. The first thing that you notice in this trendy stylish kitchen is the bold patterned mosaic tile accent wall. To allow this feature to fully stand out in the space, all the other design elements were kept plain, simple and neutral. 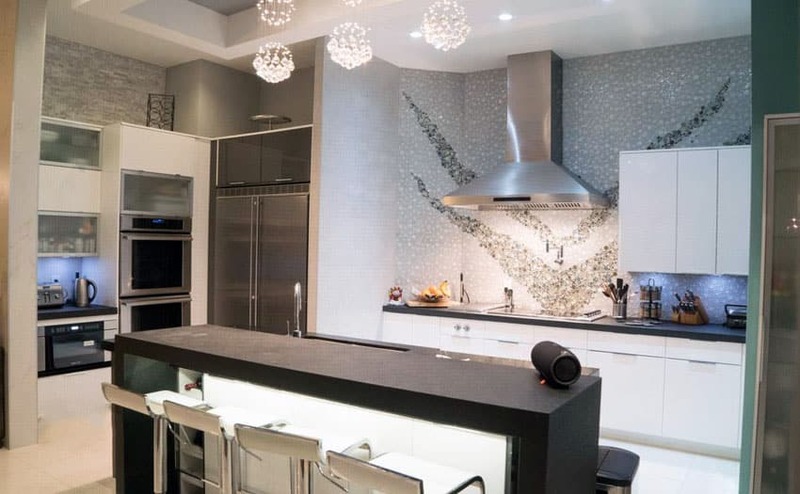 Even the waterfall island had minimal decor , but instead it featured a strong black granite counter top which renders a statement in terms of color, but does not compete with the focal point of the space. Sleek white cabinets, white ceiling, white flooring and white modern bar stools all make this kitchen appear brighter and more spacious. While the use of stainless steel appliances and cabinet handles complement the modern vibe of the space. Counter tops for waterfall kitchen islands are not limited to traditional materials alone, but one can get creative in exploring new options to produce a design that is eye catching. 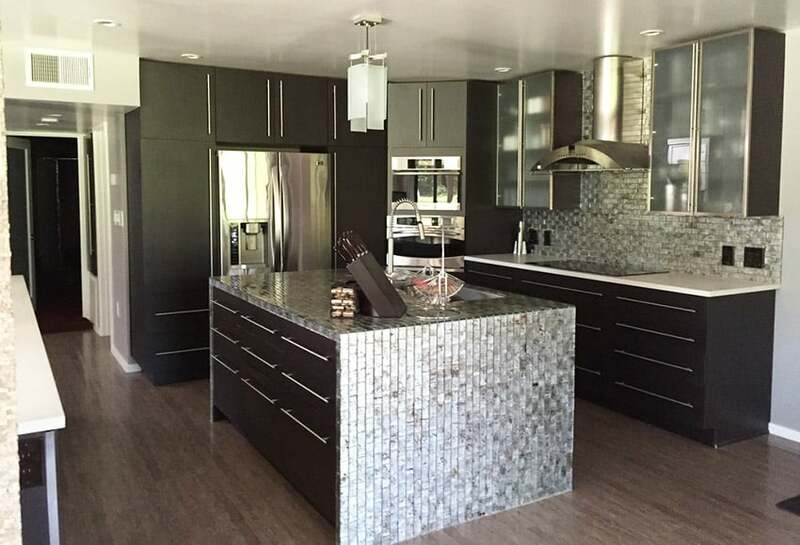 This contemporary kitchen features a waterfall island that is furnished with glass mosaic tiles. The appearance of glass tiles creates a luminous effect as lights shine over its surface, producing an exquisite, bold statement for the space. The splash board also makes use of the same tiles which give an accent to a full wall of cabinetry. Combining it with dark wenge kitchen cabinets, medium stained wood flooring and white counter tops, a layering of contrasting colors and textures are formed. 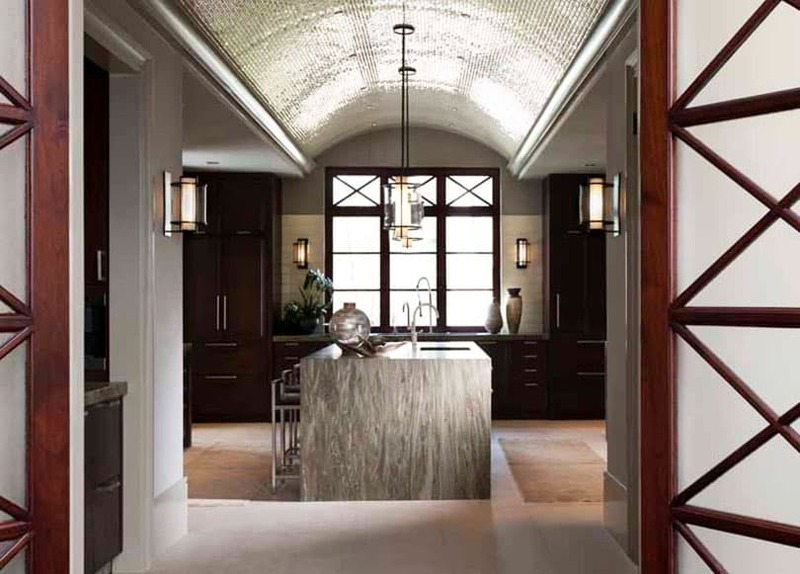 Waterfall islands work best in open plans because people can get a full view of the magnificent stone on display, whether they may be in then dining room or the living room. A waterfall island can also effectively delineate spaces without obstruction. This luxury kitchen features a full wall of overhead and under counter cabinets with stainless steel built in appliances. The muted taupe color of the cabinetry renders a quiet strength and a statement to the space. Lavish marble floors give a timeless appeal while a mosaic tile splash board provides a sophisticated accent. The waterfall island makes use of beautiful beige granite with a glass overhang that serves as a breakfast nook for three. Wine red fully upholstered bar stools display a touch of color which is not too intense for the formality of the space. Instead of conforming to the usual waterfall island design, why not give it a modern twist to make a kitchen more visually interesting. At the center of this stylish modern kitchen is a thick solid wood butcher’s block that is fixed over a center kitchen island. This waterfall island with a single end panel, gives not only a stunning point of interest but can also serve an additional prep counter or casual dining space. Standing out against a full white background, the warm color of this waterfall island brings in a touch of natural coziness and color to the space. Medium stained wood plank flooring complement its color, making the kitchen more welcoming. 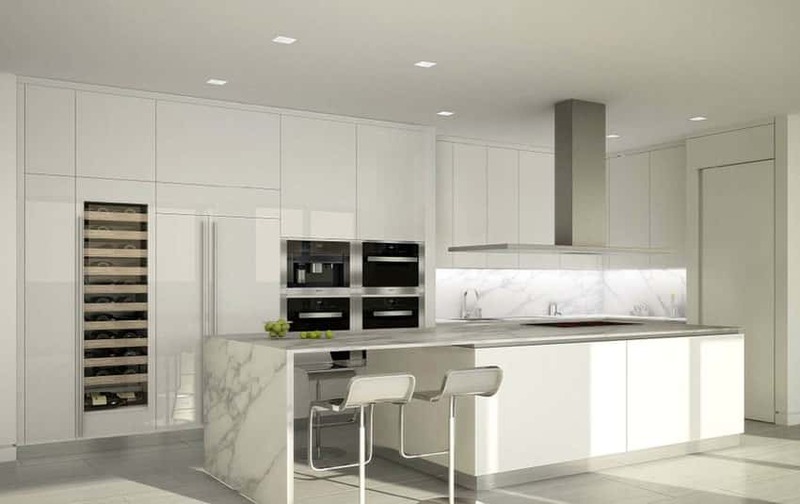 While full white high gloss kitchen cabinets render a bright and airy atmosphere to the space. A waterfall island is the perfect way to update the look of a traditional inspired kitchen. This classic kitchen gets modernized with the use of a striking granite waterfall counter that also serves as the focal point for the space. With large mottled patterns of shades of gray, taupe, ivory and brown, this granite looks extra bold when displayed in a larger scale. 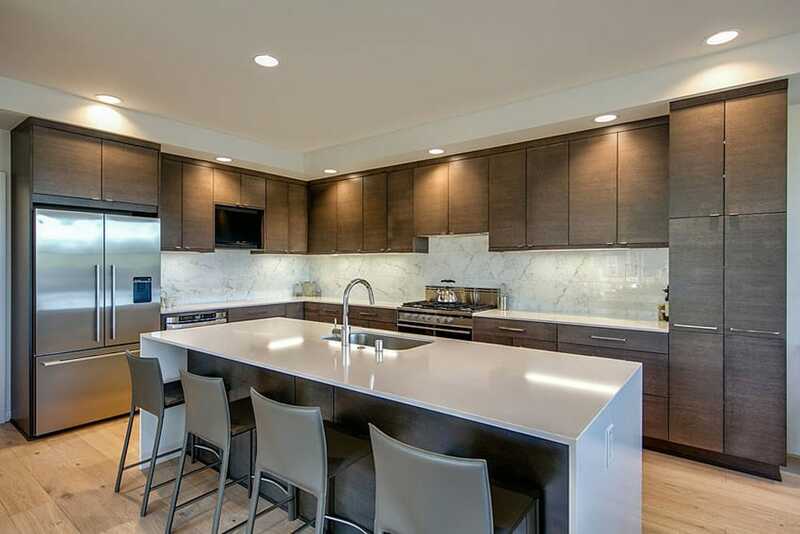 The waterfall island also makes use of white cabinetry that does not compete with the strong appeal of the stone. Gorgeous light cherry flooring allows the island to “float” against a warm background, while walnut inset kitchen cabinets provide an element of warmth to the color palette of this space.